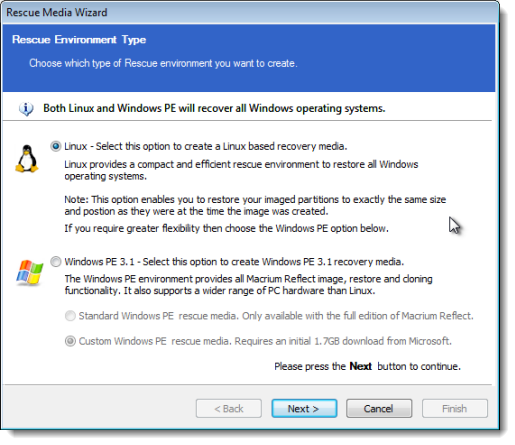 In the resulting dialog, access the default Linux option for the type of rescue media to create. (I'll discuss when to use other options below.) Either one can be used to restore Windows and other operating systems. The drive that represents your CD/DVD burner. Be sure to insert a blank, writable disc. "Create ISO image file" if this computer has no burner or you simply want to save the ISO image to be burned to a disc or on another machine later. Click Next and Macrium will either begin burning the rescue media to disc, or it'll ask you where to place the ISO file that it will create. You either have rescue media ready to go or an ISO file that you can burn to disc on another machine. At this point, I strongly suggest rebooting your computer from the rescue media that you've just created. With so many different computers and backup devices out there, it's not unheard of for rescue media (from any backup software vendor) to not necessarily boot or see your particular backup device. The rescue disc can "see" your backup drive. That confirms that should you ever need it, you'll be able to use that disc to boot and restore your backup. Burning rescue media with compatibility mode enabled would be the place to start. If that fails for some reason, then burning a Windows-based rescue media would be next (although be aware that this may require a rather large download from Microsoft). With working rescue media in hand, you're ready to start backing up. After purchasing and installing backup software, one of the very first things you should do is create rescue media. 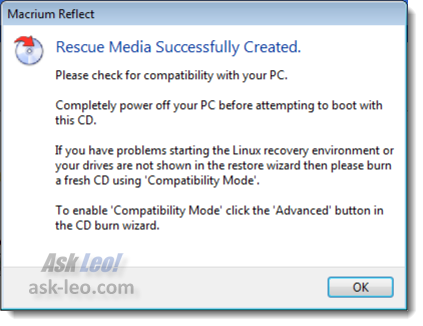 Rescue media are the CDs that you might boot from should you ever need to restore your machine from some kind of an unbootable state. I'll show you how to do that here with Macrium Reflect. Once you start Macrium, select Other Tasks menu and the Create Rescue Media option. You have your choice of using either a Linux or Windows-based boot disk. Many people choose Linux but if you have problems booting from that media or have problems with it being able to recognize your backup device, go ahead and burn a copy of a Windows-based rescue media as well. We'll select Next. In this particular case, I only have the option to create an ISO image file because I do not have a CD burner on this machine. On another machine, that dropdown includes the actual drive letter for my CD burner. We can select that and Macrium will actually burn the CD directly. In this particular case, we'll create the ISO image file that can then be taken to another machine that will be able to burn this image to a CD. Hit Finish. We're given the option of where we might want to store that file. I will throw that here. I'll hit Save and the ISO file is created. If this were an actual CD burner that was available, then the CD would be burning as well. 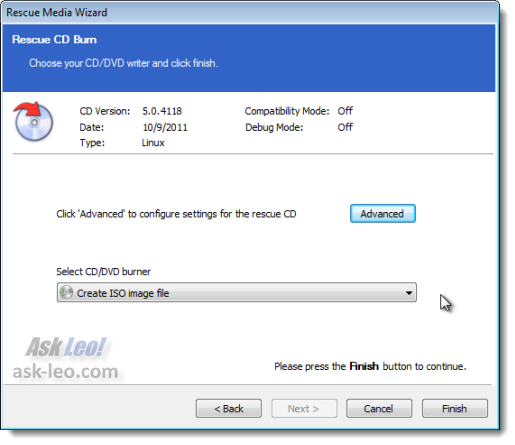 Once the ISO has been burned to CD or Macrium has burned the CD directly, you now have your bootable rescue media. It's important at this point, before you actually need it, to actually boot from the CD that you just created. The reason I say that is that it's important to understand whether or not that particular version of rescue media will a.) boot your machine and b.) actually see any backup devices you have attached to your machine. Regardless of the backup program that you're actually using, rescue CDs are notorious for not necessarily recognizing absolutely every external hard drive or backup device that you might have. Macrium includes several options to allow you to burn different versions of rescue CDs that hopefully both boot on your machine and recognize your particular backup device. Once you have your rescue media and have tested your rescue media, you're ready to start backing up. The next video in the series: Macrium Reflect 3: Making an Image Backup. That's enough for me! The only thing lacking so far is encryption, which I'd love to have, but can do without (my current backup solution, BootItNG by TeraByte Unlimited, with which I am not quite happy, doesn't have encryption, either). Telling us how much Macrium costs would be of help. Unfortunately, I can't go out and get it right now, because I'm on vacation at my brother's house in California (I live in NJ!) and won't be home for a week. Well Leo i have something to tell you and i dont think it will come as a surprise to be honest mate. You are THE MAN Leo. Ive been trying to figure out how to do all this backup malarky and have been reading the usual Geeky websites and everyone i read i hear myself saying the same old thing "thats all very well o geeky person but this is planet earth not Tharg so is there any chance of translating it into Earthling vocabulary so i might just get a slight inkling of what the hell you are talking about"!!! And then i read all 8 of your articles Leo and it was written in Planet Earth speech so the job was a doddle. Cheers for that mate and i know a geezer who will charge £75 to get ya PC back on the road and what does he do for this money? Puts a CD/DVD in and waits to prise the dosh from ya hands. Keep it up my man. Regards Ted. Confirmed! I now am home and have Macrium, and yes, it indeed does allow full backup from the CD, booting before Windows even loads! Yay! I am not very happy with the way Macrium got sold and delivered, and there were very serious glitches in its installation. For the record, my purchase and delivery experience was quite smooth. One quick question..how do you "check" to see if what you think you've created is what you actually have created? You mention this at 1:51, what are the steps? I just backed up my new desktop to get an image of what this thing looks like when its in tip top shape, so if I do have to reformat down the road I have all my programs, drivers, updates, setups, etc and I can load it back to this state easily. I followed this and step 3 to create the backup, any guidance? Although the rescue disk is Windows PE 3.1 based, it also contains the Macrium program which you would need for restoring the data. So you would need to create it. 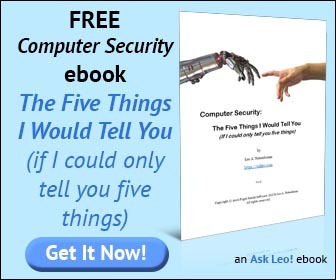 - Purchase and download of version 5 standard was OK. No problems encountered. - Installation is somehow unusual as it requires a few more steps compared to classic software installations. But in the end, this is quite easy. No problems encountered. The number # after the words 'Macrium Reflect' are not version numbers ! Did you notice this at once ? I didn't ! Contact Macrium or their forums. They'll probably have a solution for you in the form of an alternate rescue disk.